Let’s get a little disclosure out of the way right off the bat. I work for a company that does custom suits, shirts, etc. – not just as a sales guy, but high enough up the (relatively small) ladder that my input helps shape the direction of the company. Beckett & Robb is technically a competitor to Dragon Inside, although our demographics and approaches are a bit different. Today’s situation will be similar to the review I did of Combatant Gentlemen a few weeks back. However, while my previous review was done on a suit made for my large brother-in-law, today’s suit was made for my younger brother, who just happens to fall on the opposite end of the spectrum. Cache is 6′ tall and weighs in just under 130 lbs. He’s tiny. Of all of my family, he’s the skinniest, and he likes it that way. Maybe a few more months of him reading the blog will convince him he needs to put on a bit of muscle, but for now he’s content being long and lean. One of the downsides Cache experiences by having such a build, is that it’s next to impossible to find good-looking suits. He got pretty close with H&M a couple of years ago, but there are some obvious flaws here. The most egregious is the length of the jacket, and it’s a detail that’s indicative of the overall problem with fast-fashion companies – they rely heavily on trends. A year ago this short jacket would’ve been considered on point, now it’s already silly and outdated. For someone with a build like Cache’s, even more. By having the jacket so short, it exaggerates the length of his legs, making him appear taller, slimmer, and more effeminate. All three of which are implications his build has on its own and don’t need to be over exaggerated. Add to it the skinny lapels (make his shoulders look small and his head look big), the long pants (make him look both tall and sloppy), and the low rise in the crotch (too Bieberesque) and the suit makes a young, skinny guy look like a kid waiting for someone to treat him like an adult. Not a fun image to battle for a guy who’s getting married in a month, finishing college this year, and starting a career. Like me, the kid has gorilla arms and finding an off-the-rack shirt with the right sleeve length is next to impossible. Well a few months back a representative from Dragon Inside reached out to me to see if I was interested in wearing one of their suits. I almost immediately wrote them off because of the name and it’s still the biggest drawback of the company – which is too bad, because they have a lot of good things going for them. What convinced me to try them out was a mention of an Italian mill called VBC (Vitale Barbaras Canonico), it’s a mill we use at B&R and I have a couple of suits made with their cloth. This is a massive improvement over the cheaper Asian mills that are sources for the majority of online custom tailors and was enough to get me to give them a shot. The measurement and order experience with Dragon Inside was very similar to what I’ve experienced with other companies. They have the client take measurements and provide instructional videos detailing each step. Once each measurement was submitted, Cache and I went through step-by-step to determine things like lapel width and type, pocket configuration, lining, etc. All of the above have come to be expected in the online world. However, unlike any other company I’ve dealt with, I received an email from a customer-service rep about two days after submitting the order wanting to clarify a few things. A couple of Cache’s measurements came in beyond their normal allowances and they wanted to ensure that the measurements were taken correctly. It’s a simple step, but a big one and the second major point in favor of Dragon Inside. Arrival of the suit and shirt took a little over a month. Once it was here, Cache tried everything on and they were pretty close on the first go. The shirt was a bit too tight and restrictive in some areas and Dragon Inside immediately offered to remake it. The jacket sleeves were too long but, this was one of the points that their customer service rep called to talk about. It was an error on my part and, rather than remeasure Cache (who was living a few hours away from me), I let my ego and my apathy get in the way and told her I was sure about the measured length on his sleeves. I guess I deserved to have them come back too long. With the suit it was a quick alteration and one they’ve offered to reimburse me for. I’m not going to let them give me the money because I need the reminder that tailoring is like woodworking – it’s ALWAYS better to measure twice and cut once. After we got the new shirt in and the sleeves altered, everything looked great. Here’s the result. Addressing the issues from before, the length of the jacket is perfect – especially for someone as tall and slim as Cache, the break and rise of the pants are now right where they should be, and the wider peak lapels add some visual heft to his shoulders. The jacket is a bit snug in the waist for my taste, but it’s how a Cache likes it and we can let it out when he comes around to wanting it a bit larger. By going with the third piece it makes him look older and more respectable. They also made a shirt for him, and the sleeve length is right where it should be. Cache told me his fiancée became visibly weak in the knees the first time he walked out in this thing. A few more details on the suit. It’s a half-canvassed jacket and construction is done in Bulgaria. 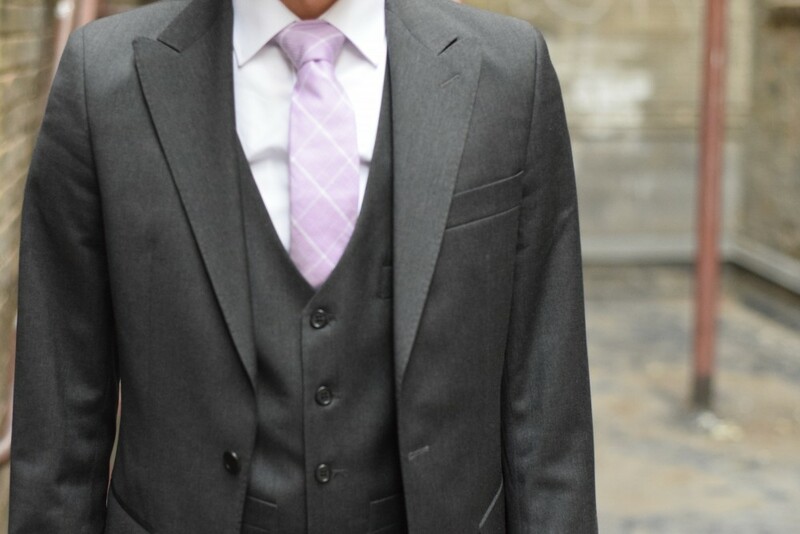 It is the Premium Dark Grey Fine Herringbone 3-Piece and retails for $689 custom or $639 RTW. The shirt is their White Two-Fold Twill and it retails for $119. Dragon Inside has a 365 day limit on alterations, which is pretty generous in this industry.